You can leverage VMware Wavemaker to create a nice web-frontend for your users to start workflows. Typically you don’t let just everybody do that, but only identified users. So you have to implement some kind of User Authentication mechanism on the web-frontend. Wavemaker provides included mechanisms to implement a login page, and authenticate the users against a database or a LDAP-directory, using a so called Security Service. This LDAP authentication also works against Active Directory. The Security Service also allows a group-based distinction into different roles: you can show or hide different parts of the website to users, depending if they are in an AD-group or not. The normal login page (automatically created when you activate this checkbox in the security service) does not allow you to re-use the user credentials “later” on webpage. But, you might need these credentials to authenticate against vCO for workflow execution. Then you have to rebuild the authentication mechanism manually, and create a JavaService to check if the user is in a specific LDAP-group. First of all, you have to configure the connection to your LDAP/AD Server. The easiest ways to do so is over the Wavemaker GUI. 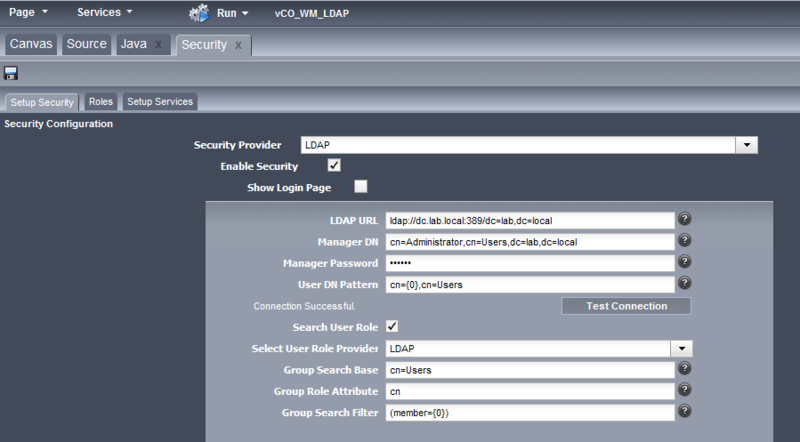 You can insert the LDAP/AD integration in the menu Services / Security. On the site you have to choose your Security Provider and to enable Security. For troubleshooting: I’m sure you remember this post on how to troubleshoot LDAP issues? 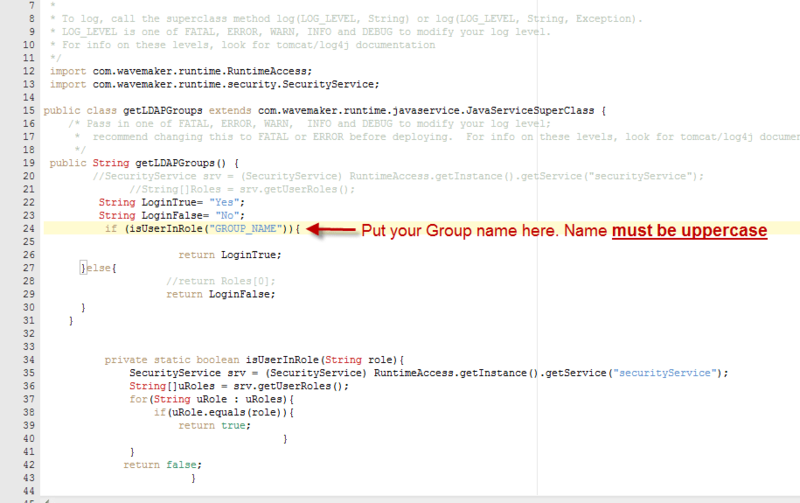 To implement the group-checking manually you have to insert a JavaService into your project. In the popup you must enter a name and a package name for the java service. In my case I choose the Service Name GroupAuth and LDAPGroupAuth. * instance, shared between all requests. * To log, call the superclass method log(LOG_LEVEL, String) or log(LOG_LEVEL, String, Exception). * LOG_LEVEL is one of FATAL, ERROR, WARN, INFO and DEBUG to modify your log level. Important here: The name of the AD-group has to be typed in UPPERCASE! Next, I had to create the “flow” of the login process, using different Layers in Wavemaker. I copy the “Login Page” Box and the scripts into my Main site. There I work with different layer and I am able to use the “variables” on all layers. For the integration of your GroupAuth into your project, you have to modify our “Login” Button. During my tests for the project, I searched for a good solution to check the credentials (Username and password) against the AD Server and validate the group membership in one step. I didn’t find a, for me, robust solution. Due that circumstance, I decided to use a temporary Auth_Layer. By clicking on the “Login” button, I check the credentials, on the Login site and after checking these where valid I check the group membership. When the user credentials where valid, the layer is changed to the “Auth_Layer”. So if the group membership of the user is okay, the user is redirected to the “Request_Layer”. If the group membership is not okay, the user is redirect to the “Denied_Layer”. Username / Password is correct (so he is logged-in from the Wavemaker Security Service perspective), but the user is NOT in the AD-group. Then he’s redirected to the “Denied_Layer”. Username / Password is correct (so he is logged-in from the Wavemaker Security Service perspective), AND he is in the AD-group. Then he’s redirected to the “Request_Layer”, which for instance contains the buttons that trigger Orchestrator Workflows. Given some restrictions of the underlying mechanisms used for the Security Service implementation in Wavemaker, it only supports groups within one Organizational Unit (OU) in Active Directory. To give you an idea about it looks like at the end of the day, download the project below! This is a Wavemaker 6.4 exported projects showing how to manually implement login and group authentication in wavemaker, redirecting to different layers.